Built in 1903 by a prominent lawyer, The White Lace Inn’s main house is a warm and inviting respite from the hectic everyday world. And they have three more houses on the grounds! Hadley House has four rooms, where suites have king bed, whirlpool, gas fireplace, TV/VCR, stereo. In addition, 3 more houses from the same period grace the grounds, and every one is a gem and a treasure. The White Lace has been written up numerous times, from the Chicago Sun Times to an appearance on the cover of Midwest Living Magazine. Country Inns Magazine rated White Lace Inn among the Top 10 inns in 1996! The owners, Dennis and Bonnie Statz, have a genuine flair for inn keeping. From the moment you walk in, you feel a sense of comfort and peaceful splendor. Bonnie’s talent as an interior decorator is apparent in every authentically decorated room of the inn! She is amazing! And they are personally a joy! Everyone is helpful and friendly too! You are going to love this place! Tell them we sent you! The foyer, the sitting rooms and dining room on the first floor are inviting, and full of antique furnishings, beautiful floorings and wall coverings. The 4 rooms in the main house are gracious, cozy, and all include a whirlpool, TV-VCR and CD stereo neatly hidden away. They are loaded with antiques and period furnishings from four-posters to ornate carved wood headboards and footboards, Victorian high-back chairs, period lamps and more. 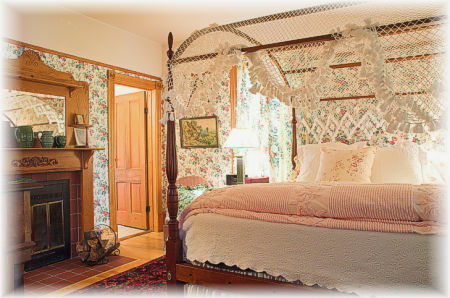 The rooms, The Door County Orchard, Old Garden Roses, English Lavender and Romantic Retreat are all spectacular – you can’t go wrong here! 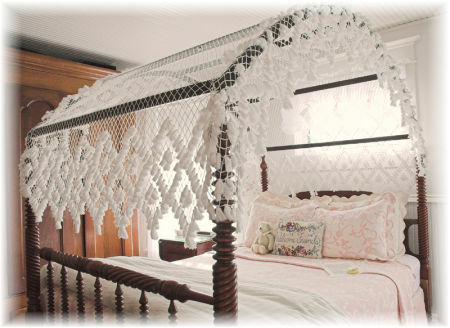 And the Romantic Retreat is tastefully done in greens and apricot, has a queen size canopy bed, Victorian loveseat and a terrifically romantic feel to it! Pictured to the right is the Door County Orchard room. * The Garden House, with 6 meticulously appointed rooms, all with wood burning fireplaces. This house was actually moved from several blocks away and was saved from demolition! The Vintage Rose, Garden View, casual Victorian, Secret Garden are all wonderful! The English Country room has inviting wicker wing chairs, an 1840’s Empire style half canopy bed, and bouquets of flowers on the Laura Ashley wallpaper that make this room warm and authentic. There is one porch and one balcony with certain rooms – ask! * The Washburn House, with 4 rooms (one is a suite), which include whirlpools, gas fireplace, TV/DVD/VCR, stereo and more. From the Royal Chamber, with a regal 4-poster, to the Wild Roses room , which gives you a sense of a summer cottage with lots of white and hand-painted roses – you will enjoy! Fabulous rooms meticulously decorated. Each room is unique and enticing, cozy, charming and inviting. * The Hadley House with 4 rooms, where the suites boast a king size bed, whirlpool, gas fireplace, TV/VCR and stereo. 3 suites in the house have either a balcony or porch. The Fall Festival Suite in this house is spectacular, with soft greens and rose accents, a mahogany plantation canopy four poster and a little balcony as well! There is a beautiful gazebo on the grounds, that many couples use for their wedding ceremony, or newlywed couples use it as a backdrop for wedding photos after the ceremony! Over 700 couples have been married at The White Lace Inn! There are no phones in the room – so if you leave your mobile phone or smart phone off, you can escape a bit! There is a library of videos you can use, and Dennis knows everyone in Sturgeon Bay that can help you plan a wedding, get you a wedding chapel, have beautiful flowers delivered to your room or even baskets of wine and fruit! Want a carriage ride in Sturgeon Bay? Dennis and Bonnie can tell you how to make arrangements! A full, scrumptious breakfast is served each day, which may include a Scandinavian Fruit Soup, cheesy egg bake, fruit stuffed French toast and a whole lot more! Coffee is available in the dining room most of the time! In fact, The White Lace Inn makes some of its recipes available to you. Some of the most popular ones are Door County Cherry Muffins, Mary's Cherry Granola (short recipe), and Mary's Corned Beef Hash/Brwn Egg Bake. You can downlaod some of their favorite recipes right on their website. In addition, the innkeepers serve afternoon and evening snacks, complimentary beverages and homemade chocolate chunk cookies! Open Year round, we found the rates to be very reasonable for the high quality of the inn. Call for rates and to make sure you have the most accurate, or click through to the White Lace Inn now to check. The White Lace Inn will send out a Guest Reminder if you sign up, to remind you of that special occasion you want to make a reservation for again (like your anniversary) and send out a card a couple of months in advance. We were very impressed with the White Lace Inn both as a charming, cozy and inviting inn, and with the people who own and run the inn! We know people who stay here year after year, and love it, and now we know why! 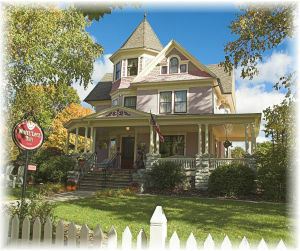 The White Lace Inn is a classic, and will enhance your stay in Door County! We were very impressed with the White Lace Inn both as a charming, cozy and inviting inn, and with the people who own and run the inn! Our DoorCountyNavigator.com users who have stayed there agree, as the inn was the Winner of DoorCountyNavigator.com's User's Choice Award for Best B&B in Door County Wisconsin (2003 - the only year we awarded this honor)!